The camshaft position (CMP) actuator system is an electro-hydraulic operated deviceused for a variety of engine performance and operational enhancements. These enhancementsinclude lower emission output through exhaust gas dilution of the intake charge inthe combustion chamber, a broader engine torque range, and improved fuel economy.The CMP actuator system accomplishes this by changing the angle or timing of the camshaftrelativeto the crankshaft position. The CMP actuator simply allows earlier or later intakeand exhaust valve opening during the four stroke engine cycle. The CMP actuator cannotvary the duration of valve opening, or the valve lift. During engine Off, engine idling conditions, and engine shutdown, the camshaft actuatoris held in the Park position. Internal to the CMP actuator assembly is a return springand a locking pin. During non-phasing modes of the camshaft, the return spring rotatesthe camshaft back to the Park position, and the locking pin retains the CMP actuatorsprocket to the camshaft. The CMP actuator system is controlled by the engine control module (ECM). 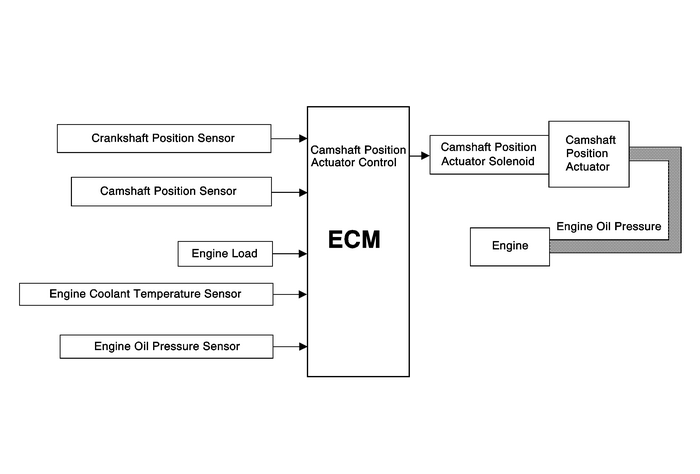 The ECMsends a signal to a CMP actuator solenoid in order to control the amount of engineoil flow to a Cam Actuator passage. The pressurized engine oil is sent to unseat thelocking pin, and to the vane and rotor assembly of the CMP actuator. There are 2-differentpassages for oil to flow through, a passage for cam advance and a passage for camretard.The Cam Actuator is attached to a camshaft and is hydraulically operated in orderto change the angle of the camshaft relative to crankshaft position (CKP). Engineoil pressure (EOP), viscosity, temperature and engine oil level can have an adverseaffect on Cam Actuator performance.